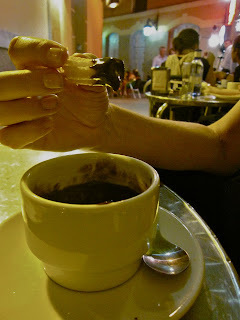 No trip to Madrid is complete without sampling the city's famous "churros con chocolate." While some people claim it's the ideal breakfast, I thought it was pretty hard to beat as a late night snack after a night out on the town. 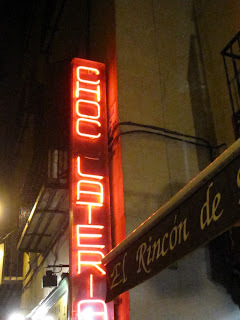 Luckily, the Chocolatería San Ginés is open 24 hours! Serving up piping hot sticks of fried dough along side cups of hot cocoa since 1894, this place is legendary but quite the hidden gem. I had the address and a map but neither helped me (and it wasn't the fact that I'd had a few glasses of wine and a shot of orujo!). A kind taxi driver finally delivered me to the neighborhood where I could literally follow my nose the rest of the way. The smell alone is a dieter's nightmare, but seriously who can diet while traveling in Spain?! I don't think something doughy, fried and sugar-coated can be described as anything other than tasty, but it's the chocolate that elevates it to a whole new level. It's dark, rich and tongue-coatingly thick. Although called hot chocolate, it's more like hot fudge, clinging decadently to the churros (and your fingers). The churros, I realized, are really just the chocolate delivery mechanism. Once the churros are gone, you have to switch to the spoon method, as you know there is no way you're leaving any chocolate behind. And because I'm a nice person, I will refrain from sharing the photos of my friend Karen drinking the last precious drops. It was that good.